The top Roman Catholic bishop in the U.S. lauds President Donald Trump for his anti-abortion views, for comments on the importance of Catholic schools and for promising to defend religious liberties. When it comes to refugees and immigration, Cardinal Daniel DiNardo says he and Trump will "have to agree to disagree." In a wide-ranging interview with The Associated Press, DiNardo, the archbishop for Galveston-Houston and president of the U.S. Conference of Catholic Bishops, expressed concerns about Trump's now court-stalled executive order blocking immigration from six Muslim-majority nations and about the effects the Trump administration's immigration policies could have on families. "We have kids in our Catholic schools that are crying during the day," DiNardo said. "They're not sure whether their mommy or daddy is going to be home at night when they get back from school. ... There's no reason why that has to happen." DiNardo in 2007 became the first Catholic cardinal in the Southern United States, an area where Catholicism has flourished as more people have moved there, from both inside and outside the U.S. 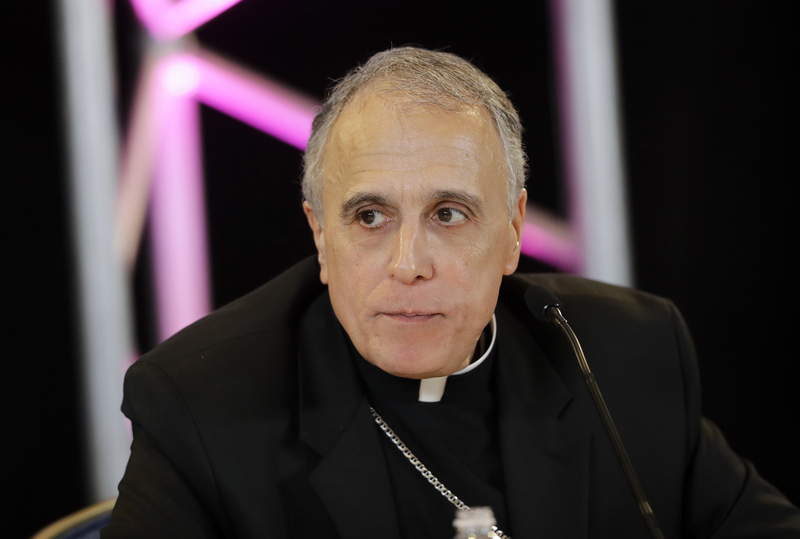 In his first extended interview since his more than 400 fellow bishops in November elected him to a three-year term as president of the U.S. bishops' conference, DiNardo said the conference has had "quiet initial talks" with the White House to arrange a session between him and Trump. The White House had no comment Wednesday on prospects for a meeting, although such a session would continue a common practice for the head of the bishops' conference to confer with the U.S. president. "Right now seems to me the administration is still too early," DiNardo said, but offered no timetable on when would be reasonable for him to speak with Trump. "They're still working on getting their act together. It's a massive thing to do to take over a federal administration." DiNardo said the conference has had "quiet initial talks" with the White House to arrange a session between him and Trump. Trump has taken a firm stance on immigration, passing executive orders to tighten border security and restrict refugees and travelers from certain countries. Homeland Security Secretary John Kelly has credited Trump's policies and widely publicized arrests of immigrants living in the U.S. illegally for a huge drop in the number of people caught by agents on the U.S.-Mexico border. The bishops' conference needs to be critical of presidential administrations at times, DiNardo said, adding that it's essential the bishops remain engaged. He pointed to the conference's statement critical of Trump's travel ban. "We're willing to register that and state that," he said. "But we always want to be able to work with every administration." DiNardo, 67, who came to Houston in 2004 as archbishop after more than six years as bishop in Sioux City, Iowa, believes most immigrants and refugees come to the U.S. for economic reasons or to flee violence in their home countries. While he agrees with the Trump administration's stance that criminals should be deported, he doesn't want to see immigrant families separated. Churches have been relying on a 2011 Immigration and Customs Enforcement directive telling agents to generally avoid "sensitive areas" such as churches, hospitals and schools when conducting deportation actions. Immigration officials said that policy is still in effect, but recent immigration arrests around the U.S., including inside courthouses, are increasing fears. DiNardo says that if immigrations agents were to show up at a church, he would advise priests to consult with legal experts at Catholic Charities. "You'd like to lower the temperature so people will speak to each other too," he said. "I think that's a dimension that religious congregations and religious people and I think even religious leadership can bring to the debate. "You don't have to lose your prophetic stance to clearly state that something's wrong. If I'm a pro-life person, I respect all persons even when I vigorously disagree. I do not want to end up with name calling." On other matters, DiNardo has denounced the use of internationally banned chemicals for attacks against Syrians as morally reprehensible and sided with Pope Francis' call for peace in Syria "through dialogue and reconciliation." The bishops' conference favors a political solution to the Syrian civil war with the U.S. working with other governments. He has decried the Palm Sunday bombings by Islamic State suicide bombers that killed at least 45 people in two Egyptian Christian churches as "unspeakable persecution." In his interview with the AP, he described the state of the Catholic Church in the United States as "good" while acknowledging struggles to attract people who aren't religious. "Part of it depends on some levels on what part of the country you're in now," he said. "In the South and Southwest, we are booming. I've dedicated 26 new church buildings in the last 12 years." "It is troubling," DiNardo said. "One of our goals in our priority plans is in fact evangelization, by first starting with us in the church." Will he also confront Trump about his draconian budget cuts to health care, especially Medicaid and subsidies for low income workers? Will he talk about the very serious escalation of warfare? Will he talk about voting rights? Will he talk about an economy that works like the 1983 pastoral letter calls for? The Good Bishop's only concerns are to control a woman's family decisions, to preserve a tradition of hate and bigotry towards LGBTQs, and to ensure a robust stream of desperate Hispanics to fill pew and purse.